What is the different between Mercury Free and Mercury SAFE, and why is it so important for my dentist to be SMART certified? When I first became a biological dentist, I was mercury free, but I was still not mercury safe! I had not placed an amalgam since dental school. This was because I had vowed in Dental School that I would never place an amalgam again after my boards. But to be honest, it was because they were ugly, and they cracked teeth. My decision had NOTHING to do with toxicity! There are LOTS of mercury free dentists in the world. BUNCHES of them. Most of the modern ones have no desire to ever place an amalgam past dental school. Unfortunately, the military still believes that mercury is perfectly safe, so military dentists are still placing LOTS of them. And though the EU has banned amalgams for children under age 6 and pregnant or breastfeeding women, by July 1, 2018, American dentists still place lots of amalgams on young children, and it shows no sign of stopping. I had no idea what being mercury safe meant back then. I still lived in the cognitive dissonance that most dentists live in, believing what we were told in dental school. We were told that it was fine. That we were safe to breathe it. That it was ok. That we did not need to take extra precautions like wearing a respirator. And I bought it. Because why would the leaders of my beloved profession LIE to us? They are all dentists too! When I started making the conversion to biological dentistry, I started doing bizarre things – like holding my breath while I was removing amalgam. My reasoning was that if I held my breath, I would not be able to breathe in the toxic vapors. I knew it was toxic at that point, but I wasn’t completely ready to convert. As I said, the delusion was real. I am grateful I no longer believe that. It took 3-4 years of growth from my initial investigation into Weston Price and my full conversion to crunchy granola biological dentist for me to finally GET it, to the point where I became mercury SAFE. It’s a journey for every single biological dentist. ALL of us go through it, because we ALL start dental school believing the lie that modern allopathic dentistry is perfectly safe. The first few years for all of us are a total learning curve. We are still trying to figure it out during that time. Give us grace, because at least we are trying and becoming believers. But baby biological dentists eventually do grow and mature into full-fledged ones J I am mentoring quite a few new biological dentists, and I am so encouraged and rewarded to see their growth! As I have grown in my journey, I have come to realize that mercury could be responsible for a lot of the physical symptoms that I have experienced over the years. In fact, it wasn’t until I was writing this blog that I realized how many symptoms I still have, even though I have cleaned up my life significantly, practice SMART removal, and have done my utmost to minimize my exposure to toxic metals. These are/were MY symptoms. Please know there are more. You can find out other symptoms of mercury toxicity here, and here and, for the real science geeks who need a published journal article, here. But this was MY list, at its worst. Chronic or recurrent yeast infections. Cancer.And yes. I believe mercury toxicity led me to almost lose my life to stage 4 endometrial cancer. But if you wish to know more now, you can join my group on Facebook, where I detail my journey with this beast. That is a LONG list of symptoms. And as of the writing of this blog, I still suffer from 8 symptoms I listed from that list. It would be 9 if I count the cancer, but I am currently cancer free (though I won’t ever take THAT for granted). I’m grateful that I am DOWN to 8 symptoms, but hope that one day, they will ALL be gone. Granted – I want to disclose that I have had SOME of these symptoms prior to going to dental school. For example, infertility. My period stopped when I was 16. My family spent 10 years in Peru when I was a child, being exposed to chemicals that were not safe, because the country was in turmoil and not able to have any kind of consequences for the industrialists while I was there – they were dealing with the Shining Path terrorists, and it was all they could do to manage them. There was a ton of pollution and very little regulation at the time. BUT, knowing what I know now, I am certain that even those symptoms were due to early heavy metals exposures. We simply didn’t know any better. Moving forward in my career, I have become mercury SAFE. What does that mean? It means that, as a dentist, I no longer believe that mercury IS safe. It’s the beginning of the rabbit hole for many dentists. When we go down this rabbit hole, we are suddenly considered crazy by the allopathic dentistry world. But for some of us, it means the difference between being able to keep practicing or having to quit. Between living or dying. So that means that when I remove it in my practice now, I follow a protocol known as the SMART protocol to remove it safely from my patients’ mouths, but also to keep myself and my team members safe. What IS the SMART protocol? SMART stands for SAFE MERCURY AMALGAM REMOVAL TECHNIQUE. What does the SMART protocol entail? Well, to summarize it, when I remove amalgams from a patient’s mouth, it means I wear a space suit, my assistant wears a space suit, and my patient wears a space suit. You can find more details out about the SMART protocol here. 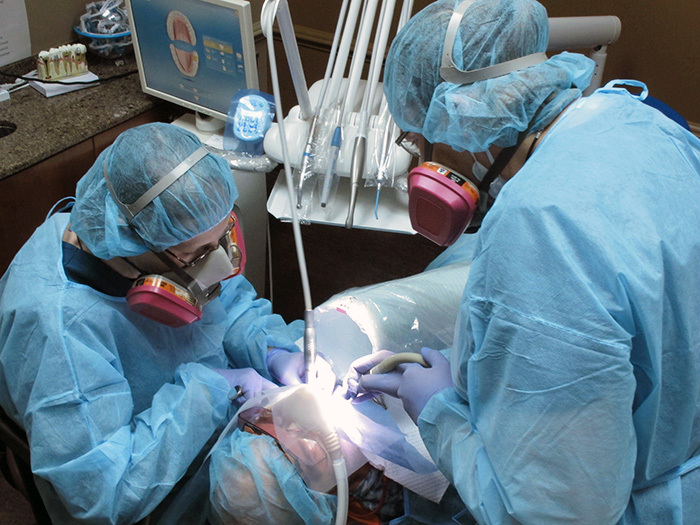 Why is it important to have a SMART certified dentist remove your amalgams? Well, simply put, mercury is toxic. It really doesn’t matter if it’s inhaled or ingested. There isn’t a truly safe form of mercury. It’s not something you want to breathe or eat. It’s definitely NOT something you want injected into you. Amalgams do NOT become magically safe once they cross your lips and are put IN to your teeth. They are certainly not safe when they are being removed either. And when amalgams are removed, if you are not wearing the space suit, you WILL breathe in the vapors, and you WILL swallow quite a bit of it, and it WILL get on your skin and clothes and hair. And dentists who do amalgam removals, as well as their team members – they need to wear the space suit too. Because they are exposed – ALL day, EVERY day. You get to go home and get on with your life after your removal. Our exposure is an occupational hazard. And if it’s not safe for you to breathe or eat it, it’s certainly not safe for your dentist or his team to breathe it either. So, if you go to a dentist who agrees to put the space suit on you, but allows their pregnant assistant to breathe in the vapors with no real personal protective equipment including the special mercury respirator, then they are not true believers. You have no guarantee that they are following the SMART protocols, because they are still exposing themselves and their team members. If you have amalgams in your mouth and you are considering removing them, choose a SMART certified dentist. Of course, I am always honored if someone chooses ME. But I realize I can’t be the dentist to the world. Here is a link to show you how to find one who is perhaps closer to where you live. The IAOMT is a phenomenal resource for both dentists and lay people to learn about toxicology. Please do yourself a HUGE favor by watching the videos on SMART removal, so that you can see what that needs to look like in any office you are considering for removing your amalgams.